Depending on your job some tools makes life easier.For the people who are continuously recording audio, making voice-overs for podcasts, professional audio, music albums Blue Yeti Microphone grab the number one position. 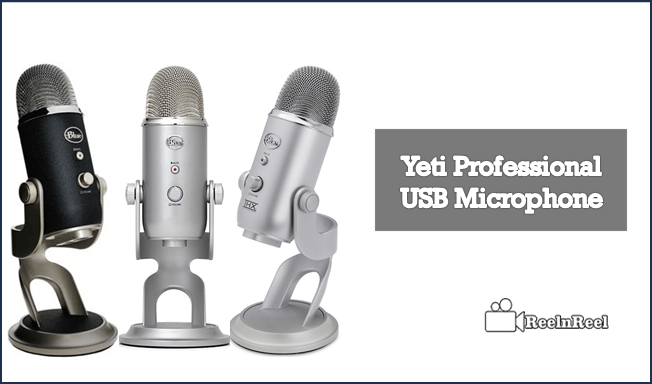 The Yeti Professional USB Microphone is one of the best option use for recording audio. It is versatile, easy to use and plug and play professional audio recording gadget. When you plug Yeti into your computer immediately it’s ready for recording. Works for the programs such as Skype, Audacity, FL Studio, Google Hangouts, Vegas Studio and OBS without any issues. The Blue Yeti comes with Yeti Pro Counterparts, Yeti Studio and four ways of recording features. There are a stereo mode features for perfect recordings, listening patterns and best for musicians and singers. Yeti Professional Microphone including a mic, adjustable removable stand, an instruction booklet, a mini USB cable. The Micro USB is used for cell phones, digital cameras, and tablets. Setting up the Yeti Microphone is quite simple and easy, as you connected a charger to the computer. When it plugged in the computer automatically pick it up. It does not need any special configurations for setting up, you can adjust the volume effects as per your requirement, give a name to your Microphone easily recognizable. Blue Yeti has fantastic build Quality. Yeti is designed with a solid metal body that gives a bit of weight to the mic, extremely sophisticated and durable. The tri-capsule array has three condensers which lead to professional audio recording. This powerful mic can record minute sounds in the space and four settings will give you a professional studio recording quality. It is omnidirectional, when you are in conference video calls, you should have a mic that can cover all sides of the background. This is also used for recording musical instruments or orchestra or record musical instruments vocalists. Blue Yeti has multiple patterns for different types of recordings like Bidirectional, Omnidirectional or stereo, and cardioid. On the front of Yeti two options available, one is the Mute button to mute the recording if you don’t need and another one is Volume for dial volume controlling, zero-latency headphone output allows you to clear output clarity. On the back of your mic, two unique features are Gain control helps to boost the volume of your vocals, if you increased the gain the chance of decreasing the audio clarity. Another one is recording modes as we discussed the above lines four types of recordings. Each mode is generated different styles of recordings like vocals, conference calls, instruments, duets, interviews and field recordings. On the bottom part of the mic, you will see three socket points to plug in one mini USB port, one headphone jack, and one shock mount thread. Anyone who are looking for high-quality audio recording Microphone I will suggest Blue Yeti Professional USB Microphone. All together Yeti is available for $149 online stores, but for sale, you may get $100 with a mini USB mic. There is no other alternative for replacing the Yeti Microphone.